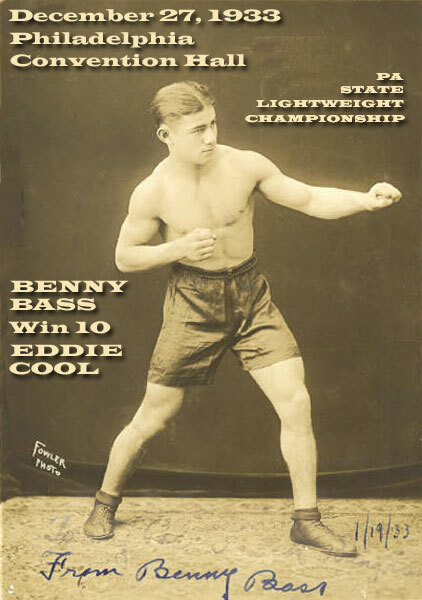 Benny Bass, the Little Fish, won a 10-round decision over the Tacony Flash, Eddie Cool, on this day in 1933 to win the Pennsylvania state lightweight title. The bout took place at Convention Hall before a crowd of 8,500. Throughout the bout, Bass was the aggressor. Although Cool seemed content to stay back and wait through most of the fight, he did have his moments. Stinging right hands occasionally jolted Bass and even had him bleeding from the left ear during the 4th round. But the Little Fish was undeterred. He pressed forward in fast motion and appeared to gain strength as the fight wore on. By the 10th, he was in total control, just like in his old championship days. This split win for the fish surprised most observers who thought the 2-1 favorite, Bass, would win by KO. But Eddie Cool was a smart and slick opponent who could handle himself in the ring and wasn't going anywhere.